How was your weekend? Can you believe that it’s Monday already and that it’s raining again. Hopefully you’re not suffering from the blues but if you are then we have something for you that should put a smile back on your face. We have something a little bit different for you this afternoon instead of the inspiration post that I usually share with you and it’s gorgeous. When photographer Veronica Hansen sent over the new ‘Summer Heart Collection’ shoot by bespoke bridal designer Otaduy I begged Charlotte to allow me to share it with you folks. Think of warm summer nights, the sweetest love memories, ethereal beauty and hot skin on skin. Not only are the gowns and delicate headpieces absolutely exquisite but I also fell in love with the brand’s philosophy, with their approach to both life and weddings. I’m not going to go into any more detail here, instead I urge you to read what they have to say for themselves below…ultimately though it’s all about your day, your way. Otaduy was born on a top-floor apartment on Keap Street, NYC one summer night with friends, music and photographs. The idea evolved until it finally took form in 2011. Our firm takes its inspiration from moments like these snapshots that remain and also from those little things we enjoy doing such as taking an espresso in a glass cup, wearing red lipstick to go to the cinema or riding a bike while listening to music on a mild spring night. Our collections are designed to celebrate a special date or any date that deserves to be celebrated. We appreciate the beauty of simplicity, of subtlety. We pay attention to detail and each one of our pieces is unique, made with love and dedication. Our collections are timeless using pure lines and simple cuts that are inspired by the natural world. We use lightweight fabrics as silks and crêpe, to give our dresses a slight air. In every detail, we transmit some of us, of our rituals. Delicate embroidery in silver thread and old gold give our dresses that vintage touch that is reminiscent of old black and white photos. And our Minerva dress is a nod to the past of the nymphs in ancient Greece. We design collections to celebrate a day that promises to be special, or simply a moment that they deserve. All the dresses are designed and handmade to order in Otaduy’s Barcelona Atelier. The headpieces are also made in the shop, where we adorn the same fabrics that our dresses are made from with jewels and other embellishments. Otaduy’s style is minimalist, soft, romantic and special, with unique details that make brides feel beautiful and like themselves. Summer Heart, the Nordic band that inspired us this summer, gives the name to our new collection, born out of love and summer afternoons. Our little summer’s rituals full of the sea, the sun, and lots and lots of love. This eclectic collection plays with transparent fabrics, open backs, and vintage touches. We’ve also experimented with two the idea of top and bottom pieces, combining them to look different and fresh. Varied mixtures of free-falling fabrics like satin, silk, tulle, trim and Chantilly lace are combined in unusual ways to make a diverse collection that’s joined by music, leisurely bike rides, the best sunsets and moonlit swims. Yes you can wear whatever you want, be it dressed in white and wearing leather boots, or wearing braids and a flower crown. You can wear satin or lace, an open back dress or paint your nails black. It is your day. 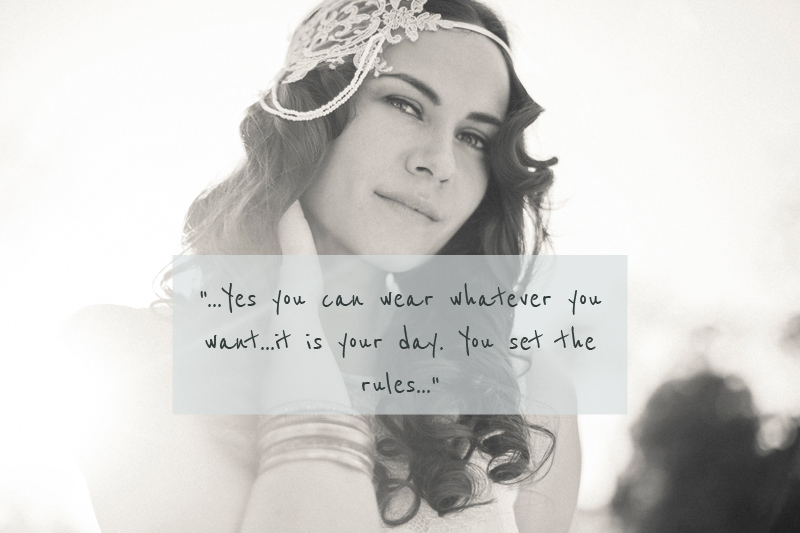 You set the rules. Or even better, you both set the rules. Because this is a tale of two people. A story that started with the first ‘I love you’ and now continues with that ‘I do’. Hair and Make-Up Stylist, Claire Frank:For the ‘Summer Heart Collection’ shoot we chose to create a very fresh and natural look both with the hair and the makeup. We accomplished this by first curling the models hair with a straightening iron before setting it with foam curlers whilst the make-up was being applied. After removing the curlers the hair was brushed out to give a more natural look with movement. The makeup intended to accentuate the natural beauty of the model, highlighting her cheekbones and under the brow. The foundation, Face and Body by Makeup Forever, is great for getting good coverage while keeping a very natural look, keeping her skin looking clean and fresh. 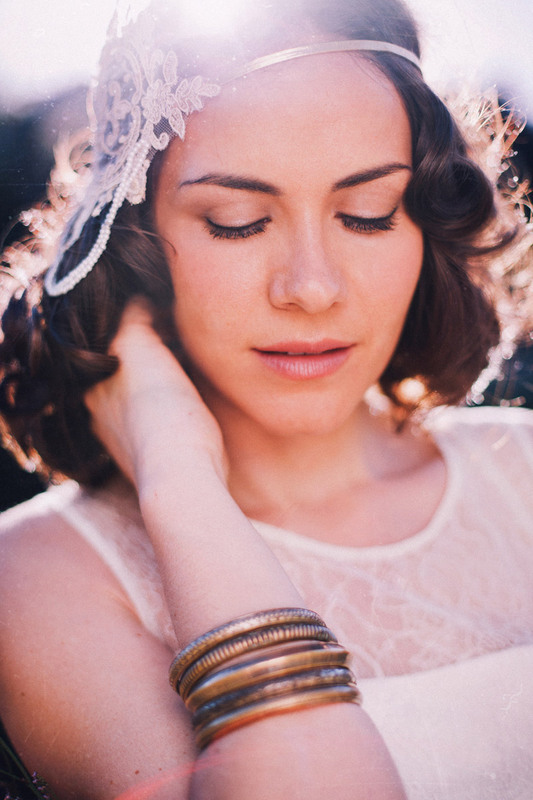 We started the first look with the curls loose for a more romantic look then opted to pin the curls up into a 20s inspired flapper-esque bob which looked amazing with the head piece she was wearing producing a more fun look – great for a bride who wants a different look for the reception. The second dress was inspired by a “Midsummer Night’s Dream,” feel, so we played with a looser curl, pinning a few strands away from the face. We stuck to the very natural makeup adding pink tones to the eyes and lips to play off the surrounding greenery. 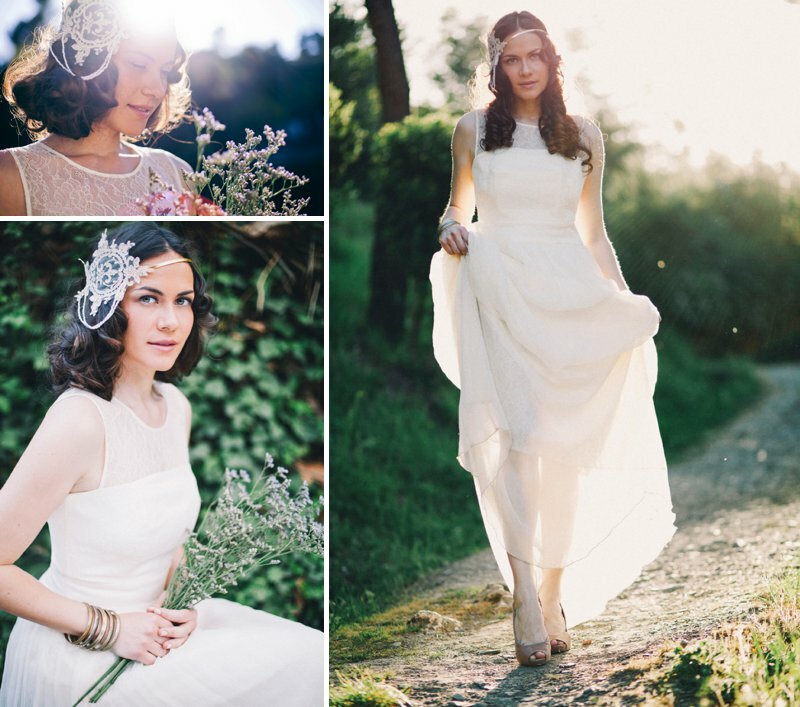 Shoot Location – Collserola Park, Catalonia. (Just North of Barcelona). I just had to include that last image of the secluded path at the end here. Doesn’t it make you dream of secret gardens and enchanted nights? So what look was your favourite then? 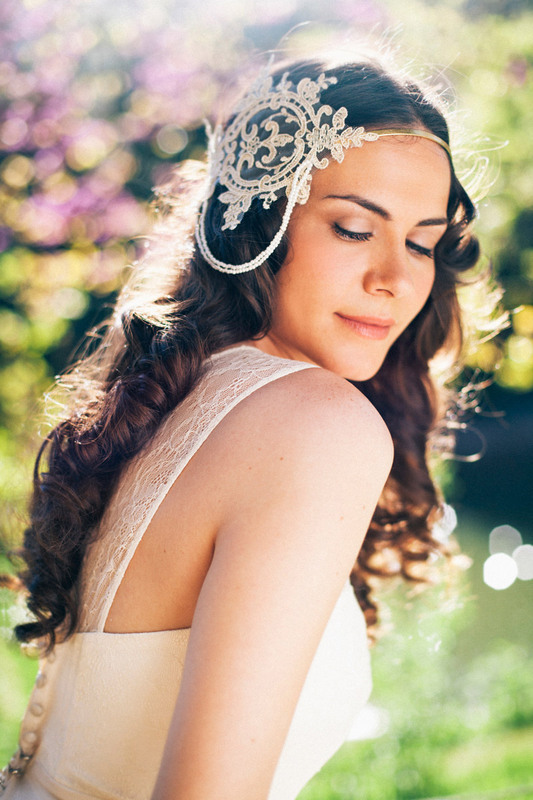 I adore that supersized lace headpiece with the pinned up curls – so dramatic yet so elegant at the same time. What inspires you and have you used any of these snippets of inspiration in your big day theme?